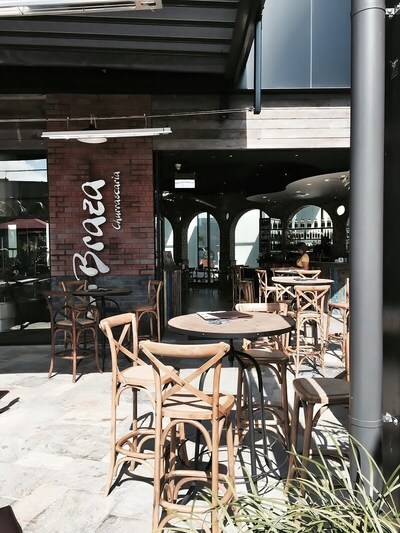 Braza Churrascaria is one of many new restaurants that has opened in the recently renovated rooftop dining area of Westfield Miranda. This new dining area, located right next to the newly opened cinema complex, makes for a great evening out in the Sutherland Shire. - Rooftops are normally reserved for parking spaces - who knew they could be this tasty? The combination of a great view, stretching all the way to the city, and tasty dishes have made Braza a hit so far, so when I went to lunch there, my expectations were high. On a sunny day, customers can choose to sit either in the large indoor area, or outside in the booths. While there is much to be gained from choosing an outdoor booth, if it’s raining or cold, the awnings won’t protect you all that well. From my vantage point in an outdoor booth I could see fire pits inside slowly cooking a huge bit of beef and a waiter walking around with a long metal skewer, pushing meat onto excited customer’s plates; that in itself shows how confident in their food and their cooking they are - though I couldn’t help but cringe at the potential for accidents. My group and I went for lunch at Braza and ordered a selection of dishes from their lunch menu to be shared like tapas. One of the plates I ordered was the cassava chips ($5). Cassava chips are a staple of the Brazilian diet and the cassava plant is used in a wide range of cooking throughout developing nations. Many cassava chips made in western cooking resembles potato chip or wedges, yet at Braza, they are made in the authentic way. 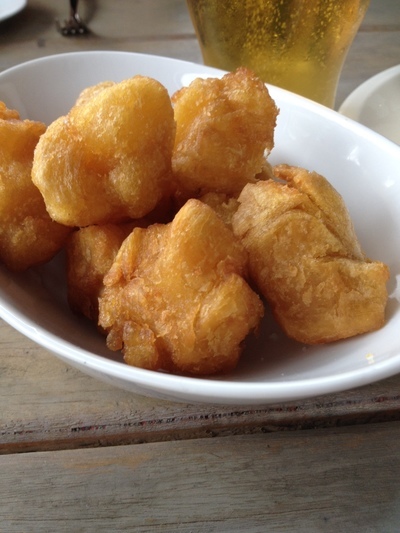 The chips, which look like a little, golden cloud, are lightly coated and fried, with less grease and salt than regular potato chips. Cassava chips are eaten as a snack in many countries and now I can see why. Given the opportunity, I would gladly eat a whole load of them. - Do you play croquette? 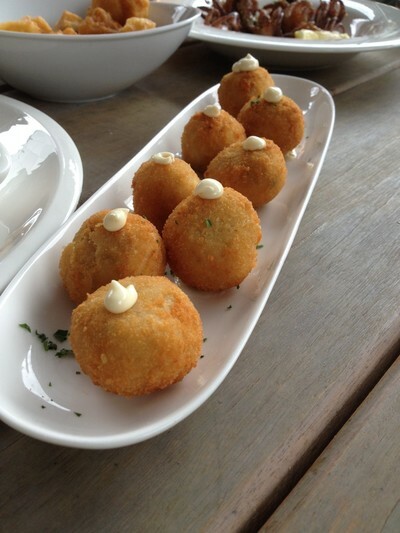 I also sampled the plate of bolinhos surprise ($8), which is a plate of eight béchamel croquettes. The croquettes sounded like they could be quite rich, but given that they looked like arancini balls and each croquette was small, I couldn’t resist. The béchamel croquettes were surprisingly smooth inside, unlike the usual arancini ball, and not nearly as rich as anticipated. That being said, I wouldn’t recommend eating this dish by yourself. - A platter full of plenty. The antipasto platter ($14) was a surprising addition to the menu as it is generally thought of as more Mediterranean. 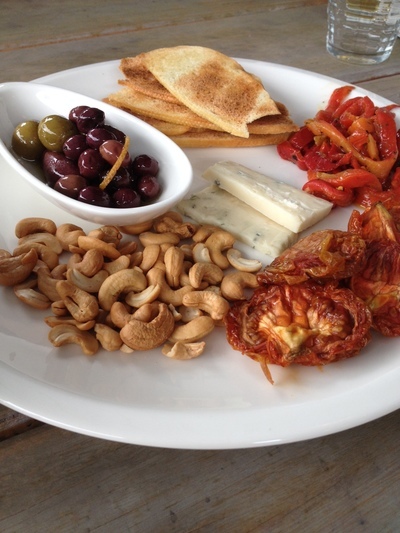 Braza’s platter consisted of sun-dried tomato, cashews, marinated olives, roast capsicum, gorgonzola and crostini. I am not a fan of olives, but the other elements were tasty. That being said, I was a little concerned about the cashews - although each element on the platter was sectioned, the nuts still touched everything else, so if you have a nut allergy and were hoping to just pick around the cashews, that is not really an option. I also tried various mini skewers of beef, lamb and chicken (from $5), with roasted vegetables. I am a little bit worried about receiving rare beef in restaurants, to my surprise however, the beef skewers were very soft and tender, and not at all rare. I suspect they slow-cook all their meats to achieve this delicious texture. These meat skewers - the beef in particular- are among the best I have eaten in a restaurant. 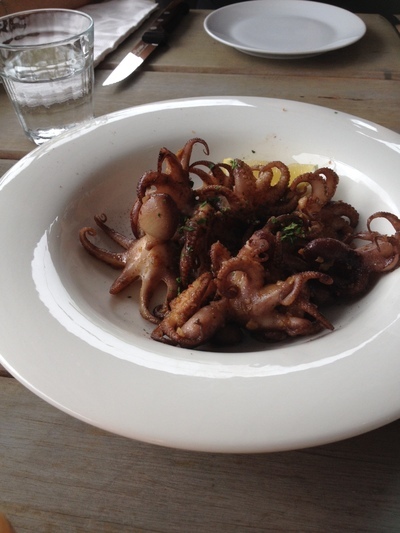 - Bowls of baby octopus. I have only been to Braza for lunch, but from others' dining experiences I have been told that during the dinner rush, customers pay a standard rate per head. Though this may not seem like a big disadvantage for some, I know that no matter how hungry I am, there is no way I could eat nearly $60 worth of meat in one sitting. I suspect other customers would be in the same position. In my opinion, this is Braza's greatest disadvantage. Braza Churrascaria in Miranda is well worth a try - though I would recommend going for lunch first. While there are individual meals, like burgers available, I think sharing plates are the best way to sample a wider array of what Braza has to offer. I also must note, that while there are vegetarian alternatives for many meals available, Braza is really a meat-lover’s heaven. Where: 600 The Kingsway, Level 4 - Rooftop Westfield Miranda, by Event Cinemas. Cost: Starters from $5. Mains from $14.50. Traditional churrasco from $54. When: Lunch: 12-3.30pm every day, dinner: 5-til late every day. Good for kids: Yes, but better for lunch. Take away: A selection of items, off the 'bar' menu such as burgers and sandwiches are available to take away.